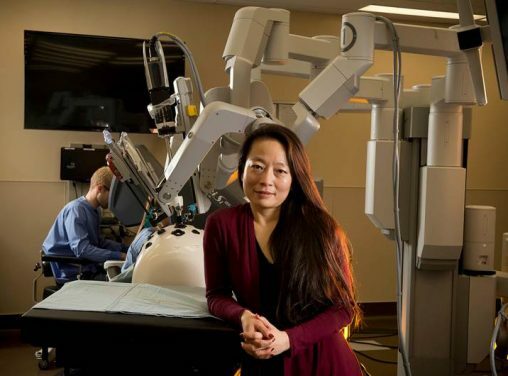 Caroline Cao and other Wright State researchers will seek funding and feedback for their revolutionary medical device that could eliminate the need for radiation-emitting X-rays in certain procedures. Wright State University researchers who have invented a revolutionary medical device that could eliminate the need for radiation-emitting X-rays in certain procedures have been selected to present their business model to Ohio’s top angel investors, entrepreneurial providers and university leaders at a prestigious statewide forum. The concept will be presented at the 2016 Ohio Collegiate Venture Showcase in Columbus on Friday, Oct. 21. The Wright State team was selected as one of seven teams, from a pool of 23, from 12 universities around the state that participated in the 2016 cohort of the I-Corps@Ohio program. The forum is sponsored by Ikove Capital Partners and presented by I-Corps@Ohio, an initiative of the Ohio Department of Higher Education designed to help faculty and graduate students from Ohio universities and colleges validate the market potential of their technologies and launch startup companies. Among those attending the forum will be angels, investors who provide capital for startups. I-Corps@Ohio is modeled after the National Science Foundation’s successful I-Corps program, which is proven to increase innovation, entrepreneurship and industry collaboration. The Ohio program is designed to accelerate commercialization of technologies from Ohio universities, colleges and research organizations while expanding the business acumen and networks of faculty and students. “The I-Corps@Ohio program has helped us validate the technology we want to commercialize with potential customers and develop a business model,” said Cao. The proposed medical device is a small, flexible optical fiber embedded with tiny semiconductor particles. The fiber, incorporated into a guidewire, can be inserted into a patient undergoing endovascular procedures such as treating the blockage of blood vessels in the peripheral vasculature, repairing aneurysms or in neurosurgery on the brain. The fiber sensor allows the real-time tracking of a flexible surgical tool, enabling physicians to guide catheters or position stents without having to constantly stop to take X-rays in order to identify the location of the catheters or guidewires. The Wright State team includes Cao, the principal investigator who will present the project at the forum; graduate student Benjamin Rinehart, the entrepreneurial lead; and mentors Sean Barnett, a Wright State associate professor of surgery who works at Dayton Children’s Hospital, and medical-technology expert Andrew Cothrel, president of Blue Marble Medical LLC. Cao’s pitch to investors at the showcase, which will feature a PowerPoint and video presentation, will likely take about 10 minutes. Meghan Sheehan and Hugh Bolton, representatives from Wright State’s Technology Transfer and Commercialization offices, will also be at the forum, helping to identify potential investors for the medical device and other Wright State technologies.